We can help you find relief from pain! Many people are affected by it and don't even know it! The temporomandibular joint (TMJ) connects your jaw to your skull and allows it to move. This joint is in constant use because you use it to talk or eat, or anytime you open or close your mouth. If the TMJ becomes misaligned or damaged, it can cause a variety of uncomfortable symptoms including persistent pain and headaches. TMJ disorder often goes undiagnosed. Many patients seek help to relieve the symptoms without really getting to the root of the problem and so never really find a solution. At our Woburn dentist’s office, we understand that having a properly aligned and functioning jaw joint is essential for the healthy function of your teeth. No matter the cause, our doctors will be able to offer a treatment solution that will resolve the uncomfortable symptoms you are experiencing. If you are suffering from any of the symptoms mentioned above, we encourage you to call our office at (781) 935-8810 and make an appointment with us for a thorough examination. We can help! How Do Our Woburn Dentists Treat TMJ Disorder? Sometimes the cause of problems from the jaw joint can be missing teeth that cause jaw misalignment. We can solve that by creating a custom restoration - an implant or bridge - to restore the proper balance. 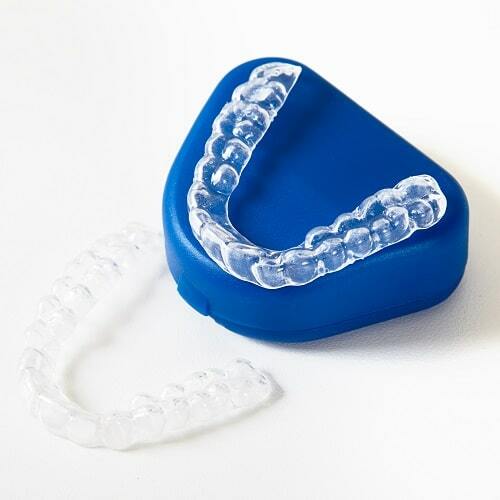 If clenching or teeth grinding is the cause of the problem, we may advise using a custom-made appliance to ease muscle pressure and protect your teeth. We help our patients find real relief from their TMJ disorder symptoms. Many people have suffered for years from headaches, neck pain, or sore jaws without relief. TMJ treatment can let you live a pain-free life again! Have you given up certain foods because of the pain and limited jaw movement caused by TMJ disorder? You’ll be able to eat them again in comfort. TMJ misalignment causes wear on the surfaces of your teeth because of the uneven pressure being exerted. This can cause your teeth to crack or break. A healthy TMJ protects the longevity of your teeth. Every one of the team members at Dental Health Care of Woburn is personally dedicated to making your experience with us simple, easy, and enjoyable. We feature cutting-edge technology that speeds up your visit and provides accurate diagnosis and treatment. 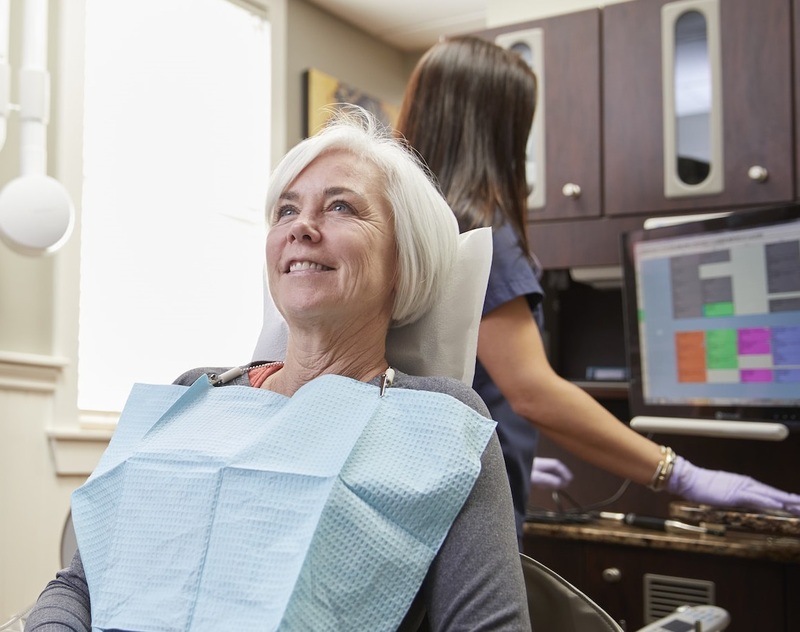 We offer nitrous oxide sedation to help you overcome any anxiety and enjoy the dental care you need and deserve. At Dental Health Care of Woburn, we say we only hire nice people. It’s true! We hope you’ll give us the opportunity to prove it. This is the best dentist I have ever been to, and if you still have a childhood fear of going to have work done, then this is the right place for you! They put you at ease and go above and beyond to help. This office is my happy place! I went to your office for the first time yesterday for a consultation. The entire experience was excellent. Your staff is professional, thorough, and put me at ease. Your technology seems to be cutting edge and more advanced than my former dentist. You put together a plan for my treatment that is clear and easy to understand. You made me feel confident that you will take good care of me. Could TMJ disorder be causing my migraines? There are many causes of persistent headaches and migraines. Joint misalignment and its accompanying pain can certainly be one of these. The only way to know for sure if TMJ disorder is the cause of your headaches or migraines is with an examination and appropriate treatment. For many of our patients, this has been the solution. At times though, other causes may be the culprit behind your head pain, and we may encourage you to visit your physician for appropriate treatment. Doesn't TMJ treatment require surgery? No, it doesn’t. Surgery should only be pursued as a last line of treatment. There are many highly effective nonsurgical and noninvasive ways to correct TMJ disorder that should be tried first. As we mentioned earlier, the solution can be as simple as performing corrective dentistry or using a custom appliance. These methods are designed to reduce pressure on the teeth, jaw, and TMJ, which will decrease pain and allow normal function of the joint. Is there anything I can do to ease the discomfort? These may help temporarily, but if the pain persists, please call our office for an appointment at (781) 935-8810. We will help you find a permanent solution. I'm looking for a dentist. Do you offer any new patient specials? Don't Live With Pain One Moment Longer! Find out if TMJ treatment is the answer for you!